Gov. 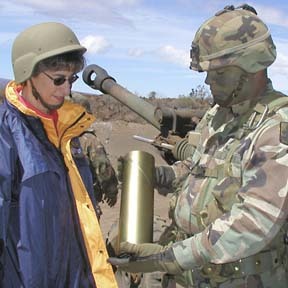 Linda Lingle received a shell casing of a 105 mm howitzer round, the first one she fired as commander-in-chief of Hawaii's National Guard, from 1st Lt. David Hatcher yesterday. Lingle was visiting 29th Brigade soldiers training at the Big Island's Pohakuloa Training Area.